Leatherback Sea Turtle from the Vancouver Aquarium. Some populations of this species are considered Critically Endangered by the IUCN. Common name: Leatherback, Leatherback Sea Turtle, Leathery Turtle, Trunkback Turtle, Coffinback, Luth. 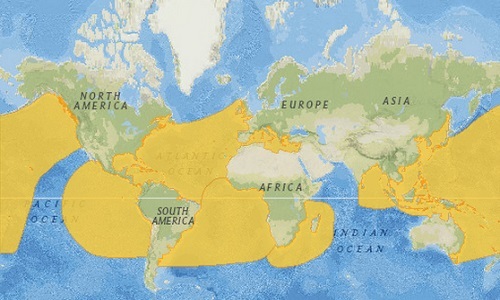 East Pacific Ocean subpopulation: Critically Endangered. Nesting females and nests declined by 97.4% during the past three generations. Northeast Indian Ocean subpopulation: Data Deficient. There is insufficient reliable trend data of this subpopulation. Northwest Atlantic Ocean subpopulation: Least Concern. Its population is widespread and increasing. Southeast Atlantic Ocean subpopulation: Data Deficient. Long term data on this subpopulation is unavailable. Southwest Atlantic Ocean subpopulation: Critically Endangered. There are only 35 mature individuals in the wild. Southwest Indian Ocean subpopulation: Critically Endangered. There are only 135 adult individuals and its population is declining. West Pacific Ocean Subpopulation: Critically Endangered. A population decline of 96% is estimated by 2040. Leatherbacks are protected by national and international laws, treaties and agreements. Annex II of the SPAW Protocol to the Cartagena Convention. Leatherback turtles have a circumpolar distribution. They nest in tropical beaches and migrate to temperate and sub-polar latitudes. All subpopulations are genetically distinct. They have the largest distribution of any turtle species. The East Pacific leatherback population nests along the Pacific coasts of the Americas from Mexico in the north to Ecuador in the South. Its distribution overlaps with that of the West Pacific subpopulation but it is genetically distinct. The Northeast Indian Ocean subpopulation nests mostly in the Andaman and Nicobar Islands, India and Sri Lanka. To a lesser extend in Thailand, Sumatra and Indonesia. The Northwest Atlantic Ocean subpopulation nests in the southeastern U.S, Caribbean, Gulf of Mexico, Mediterranean and northwestern Africa. The Southeast Atlantic Ocean subpopulation nests in Bioko Island, Equatorial Guinea, Gabon, Congo, Senegal and Angola. Its habitat extends across the Atlantic to Brazil, Uruguay and Argentina. The Southwest Atlantic Ocean subpopulation nests only in southern Brazil. Its habitat extends across the equator and east to the coast of Atlantic Africa and south to South Africa. The Southwest Indian Ocean subpopulation nests along the Indian Ocean coast of South Africa and its distribution extends to Cape of Good Hope in the Indian and Atlantic Oceans. The Leatherback Sea Turtle has a circumpolar distribution. Map adapted from IUCN. Their habitat includes tropical, temperate and some subarctic oceans. The only time (only females) they venture into land is when they lay eggs on sandy beaches. The leatherback sea turtle is the largest of the living turtles. Its shell is not hard like that of other sea turtles instead it consists of bones covered with connective tissue and dark brown rubbery skin. It is somewhat flexible. Its carapace is about 1.5 inches (4 cm) and has 7 ridges giving it a hydrodynamic structure. Their bodies are insulated with a layer of fat to withstand cold water temperatures. Its front flippers are longer than that of other turtles, they lack scales and do not have claws. Their black flippers are paddle-shaped. Leatherback sea turtles weight from 550 to 1,982 lb (250 to 900 kg). Their length ranges from 57 to 63 in (1.45 to 1.60 m). 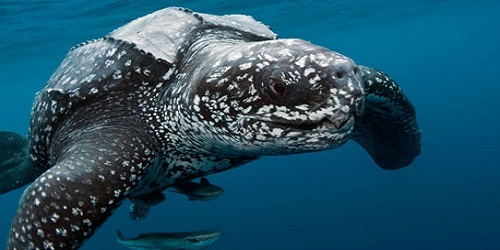 Leatherback turtles feed in waters colder than other sea turtles. They migrate long distances between feeding and nesting grounds traveling an average of 3,700 miles (6,000 km) each way. These species can dive up to 4,200 feet (1,280 meters) deep and remain submerged for up to 85 minutes. They migrate long distances to sandy tropical beaches to lay their eggs. Turtles mate in water between April and November. Female leatherbacks excavate a hole in the sand, lay their eggs and cover them with sand to discourage predation. Gestation period is from 55 to 75 days. Clutch size is 50 to 170 eggs. An average of 50% of hatchlings will survive. They lay about 5 to 7 clutches every 9 to 10 days. There is no parental involvement after the female lays her eggs. Leatherbacks are carnivores. Its main diet consists of jellyfish and salp. They also eat crustaceans, fish, sea urchins, snails and zooplankton. Incidental capture of leatherback turtles in fishing nets. Consumption of turtle meat and eggs by humans. Pollution of the seas and beaches. Human encroachment of coastal environments.